It's not stalking if you have a licence: Quick Reviews: 'Uncovering Reasonable Doubt" & "Forensic Testimonial Evidence Recovery"
Quick Reviews: 'Uncovering Reasonable Doubt" & "Forensic Testimonial Evidence Recovery"
Hello Dear Reader. 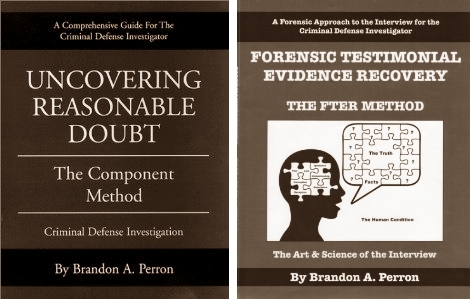 Some time ago I purchased two texts by Brandon A. Perron in regards to Criminal Defence Investigations: "Uncovering Reasonable Doubt: the Component Method" and "Forensic Testimonial Evidence Recovery: the FTER Method". It kind of makes sense to review them together as the books complement each other in a number of ways. Each chapter provides a fairly basic run-down of salient points pertinent to that component as well as supporting case studies, sample forms or diagrams, examples of questions etc. Given that the shortest chapter is about 6 pages and the longest around 20, some in-depth exploration of the subjects might have been omitted for sake of brevity. However, as Perron states in the introduction, "...the manual was developed as a basic guide and reference source..." and, in that, I believe he has delivered. The second book, "Forensic Testimonial Evidence Recovery", focuses more narrowly on conducting interviews with the view of obtaining testimonial evidence in use of a criminal defence investigation. As such, the FTER Method might be seen as a subset of the Component Method, specifically addressing Components 2 and 5. Perron explores the notion of critical thinking and the nature of 'truth' before introducing the reader to elements of deception and then the mechanics of conducting interviews. As in "Uncovering Reasonable Doubt", Perron has organised "Forensic Testimonial Evidence Recovery" in a straightforward and logical manner. The only real complaints I have are to do with formatting as opposed to content, and even that has no real basis. Both volumes are around 100 pages each ("Uncovering Reasonable Doubt" slightly longer) yet pack a lot of information into those few pages. So, how did both stack up in the end? Brevity. Pretty much to the point. Examples aplenty. Perron provides plenty of case studies, sample documents etc to support the text. Actually, not all that much. Perhaps (particularly in "Uncovering Reasonable Doubt") age of the text might be a bit of an issue and the book could do with a revision with the rise of digital photography, new techniques in DNA profiling etc, but both of these are such minor instances in the book to begin with. Formatting. I found the changing fonts in "Uncovering Reasonable Doubt" a little distracting - sure, they were to differentiate between content and examples - but maybe could have picked something other than courier. Also, why the significantly larger text in "FTER"? The price. Around US$38.00 each which seems a little overpriced, but then you should be able to find a copy for less if you look hard enough. I'll give both a sound B+/A- for content. It is worthwhile to remember that these texts are intended as a reference rather than a definitive 'how to' guide. Subjects covered are given sufficient, if cursory, exploration and explanation for that purpose. Definitely worth adding to your collection, particularly so if you are involved in criminal defence work.